In the last years I have been working on my PHP Scanner (now called RIPS) which has been released recently during the Month Of PHP Security and was awarded as the 2nd best external submission. 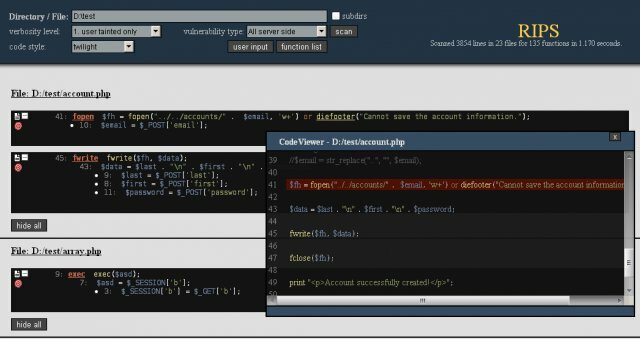 RIPS is a tool written in PHP itself and designed to easily detect, review and exploit PHP vulnerabilities by static source code and taint analysis. It is open source and freely available at SourceForge (yey!). Before using it I recommend reading the paper (HTML, PDF) I submitted to be aware of the limitations RIPS has, either due to static source code analysis or because of my implementation of it. In short: RIPS is not ready yet for firing it on big code trees like wordpress, but I think it does a good job for home-made or smaller open source apps and in assisting code reviews. I hope I will find time in the future to improve RIPS and I am honestly thankful for any feedback, bugreports, code improvements or feature requests. Update 04.07.10: A new version 0.31 has been released. Update 13.08.10: A new version 0.32 has been released. Update 11.09.10: A new version 0.33 has been released. You are currently browsing the Reiners' Weblog blog archives for June, 2010.